On the one hand, I lament the fact that the overall increases in gas prices ahead of us will mean people become less well-traveled. Then I think that most of the car travel we do doesn’t make us “well-traveled” in the sense of exposing us to new knowledge but only to more blurred miles between points A and B as fast as we can possibly go without getting caught by the law. That kind of travel isn’t about seeing, touching or knowing at all. And then, after searching far into our woods for Showy Orchis plants we’d seen somewhere but couldn’t quite remember exactly where, while the cows took up residence in our pasture last week it became necessary to accompany the dog-on-leash into his accustomed swath of woods for his morning business, I look down at my feet and here’s a little patch of the illusive plant we’d “traveled” to find. It wasn’t fifty feet from our own back door. I agree with you. I’m hopeful that people will use this opportunity to rediscover and reinvent the world near to them. It seems like one of the things we’ve lost here in the small towns and cities of the Midwest is a sense of enjoying what we have or making use of what we have. If you want do something around here, you have to drive to St. Louis or Chicago. Maybe as people are more interested in “staying home” more events and activities will bloom. I’m hopeful. But even more than that, I think you’re suggesting a “slow down and pay attention to the world” approach. I know I’ve already done that. I prefer to ride my bike on little errands, as opposed to driving the car. There’s an immediacy in walking or biking that has totally been lost on the car driving society we’ve become. Looking up — clouds, weather, etc. Looking off into the distance — sunrises, sunsets – what causes different colors etc. Looking down – like today’s entry. All sorts of fuel conserving yet fascinating possibilities. 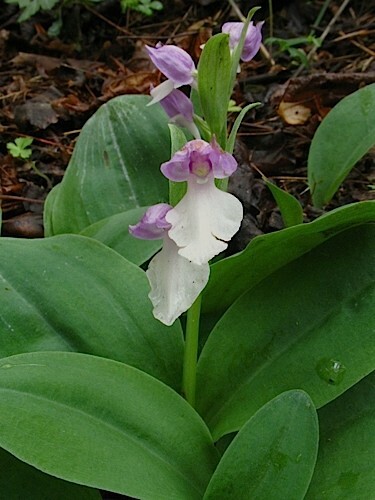 orchis? i’ve never heard of that. did you mean wild orchid, or is this something different? i’ve discovered a treasure trove of wildflowers and plants this spring, hiking behind our house. we weren’t here last year, and the cove stretches back behind us for miles, it seems. there’s all kinds of little cowpaths and such. the only bad part is the ticks. i need a littel field guide or something, though, because many i don’t recognize. some that i do are trillium, wild ginger, mayapple, bloodroot, and phlox.